When I asked to review a restaurant called “Andamental”, I was extremely curious and interested. The name sounded quirky and contemporary; but most importantly it sounded all about the EGG – which I personally love. I like everything prepared from eggs – boiled, omelettes, curries, desserts, rice preparations – everything! We visited the place on a Friday evening. It is pretty easy to locate even though it has opened only about five months ago. The decor is neat and simple but not too appealing. But that could mainly be because it is more of a takeaway/home delivery kind of place. The manager was very courteous and suggested the best dishes for us. Based on her recommendations, we ordered Australian Omelette and Afghani Anda curry first. Both dishes were served without a very long wait. The Australian Omelette, served with buttered pav, was heavenly. It was loaded with veggies, herbs and CHEESE. It had finely diced broccoli, zuchinni, onions and really divine smelling herbs. The buttered pav was the perfect accompaniment. The Afghani Anda curry was a tomato based curry with a fried egg and a boiled egg inside the curry. It was well seasoned and not too spicy. The taste was very different from the regular Moghlai curries. This too was served with buttered pav. We then ordered their signature dish which is Street Style Anda Bhurji, and I must say it was bang on. And I guess the buttered pav just makes everything better. Since we also wanted to sample some vegetarian dishes, we ordered the Mental Maggi Masala and Paneer Makkhanwala. 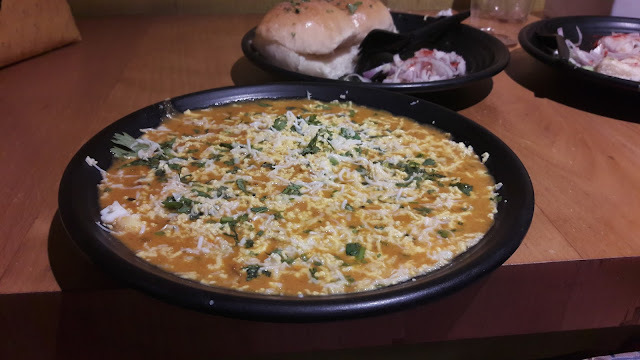 The Mental Maggi Masala was a bit of a disappointment, but we really liked the texture and flavour of Paneer Makkhanwala. We wrapped up our meal with the Andamental Biryani. Colourful, flavoured rice topped with boiled eggs and infused with Andamental's signature gravy was a big hit. The portion is huge and we had a hard time finishing everything and had to pack some home. Overall I think the quality and taste of the food is very good. They also have other interesting sounding dishes like the Andamental Maggie, Mumbai Vadapav omelette, Andamental Ghotala etc.., which are apparently the hottest selling items on the menu. Definitely on my list for my next visit! For vegetarians, Andamental has a variety of non-eggitarian dishes like Paneer roll, aloo roll, choice of various curries, biryanis. I would definitely recommend our readers to try this place out. My only suggestion would be that if you are a big group of diners, opt for a takeaway, since this place is a little compact. But a big thumbs-up to the chef and the Andamental team for coming up with a unique and interesting menu!! Sounds like an interesting place. And happy new year Aditi. Lovely review. It is absolutely a must try restaurant for all the egg fanatics. You may also order food from Andamental right at your doorstep using Mangaaoo Food Ordering and Delivery App. We look forward for more articles. Cheers!!! To get onlinefreerobux for the free roblox robux game to play free then use my link http://onlinefreerobux.com/ for the free robux generation for the free roblox robux game to play free.